These trees are all over town. When C and I go on our walks I'll notice quite frequently that I smell macaroni. Whenever I smell macaroni, theses trees seem to be around. I'm thinking they are the culprits. beautiful tree! What kind is it? 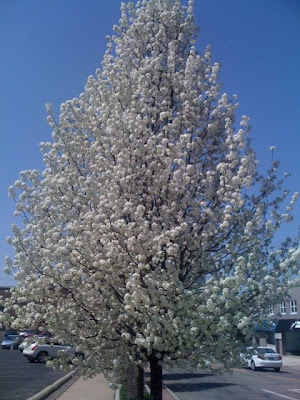 This way I can add to my store of useless trivia...what kind of tree when in bloom smells like macaroni??? hee-hee!